Some time back, Swamplot's Allyn West and his commenters were discussing Houston's never-ending quest to become more of a tourist town. Not everyone is on board with that mission, least of all Swamplot commenter Old School, who believed Houston's relative lack of tourists was a boon for the city. "Tourists clog up restaurants, bring out supid T-shirt shops and fill the streets with silly duck boat cars and double decker buses," he wrote. Well, at least one of the things Old School abhors about tourists has arrived. Behold! Seated out in front of La Carafe Sunday afternoon, this behemoth appeared as out of a vision and rumbled past down Congress, an open-top tomato-red double-decker bus that looked straight from Trafalgar Square or Piccadilly Circus or Upper Ramsbottom Crescent or wherever. It's a cool sight, if more than a little hallucinatory. Houstonia colleague Katharine Shilcutt says she thought she was high the first time she saw one. The bus is brought to you by Houston City Tours and they bill it as "The first open top London Double Decker Tour Bus in Houston." Tours leave from the George R. Brown Convention Center thrice daily -- at 9:50 A.M., 11:25 A.M., and 12:45 P.M. There are six stops along the circuit: the GRB, Market Square Park, City Hall / Houston Visitors Center, the Downtown Aquarium, Hermann Park and the Museum District. Tickets are a bit steep: $29.95 for adults, $25.95 for seniors, $19.95 for kids and a buck for infants. Riders may hop and off all day long for the price of a single ticket, but the bus heads back for the barn around two P.M.
"Admire the most symbolic and breathtaking sites, gaze up in wonder at the monumental Chase Tower, and be delighted by sights of the colorful Theater District," Houston City Tours gushes at their Web site. "You’ll get a taste of high culture at the Museum District, home to some of the world’s most famous works of art." 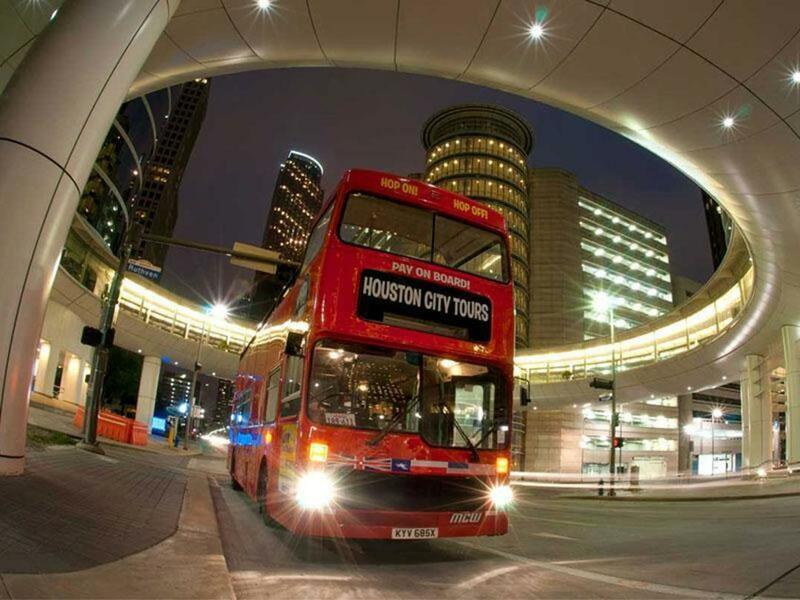 Houston City Tours is offering a special deal right now -- a free ride aboard the bus with the purchase of a ticket to Space Center Houston. Click here and scroll down a bit for details.